Here we have listed a few positive reports we have received from clients over the many years Steve has been offering Dog Training and Behaviour Services. You may find something that strikes a cord with you and maybe will give you hope that your situation can improve. We would like to state that K9Pro have never coached, altered or solicited these testimonials. I went to see Steve Courtney with my Staffordshire Terrier, Sezzy, who was terrified of storms and very dog aggressive. I love dogs but I don’t know very much about them, but that didn’t matter to Steve. He structured a program that was at my level and I could manage with my three children. I applied the techniques and it was in no time that I could see real improvements. The thunderstorms no longer freak my dog out and make her hurt herself trying to get away from them, and whilst she doesn’t really “like” other dogs, I can now have her off leash around other dogs playing ball, incident free. Gyro is my Australian Cattle Dog, he was miss behaving and I went for a lesson with a “working dog trainer/behaviourist”. I left there thinking that I had been hard on my dog and that he needed a job, so they enrolled me in a herding class. I needed to go 4 days a week and although I did see some improvement initially, he was back to behaving the same again in a month or so. I also was struggling to keep attending the 4 days a week they said Gyro needed and I was made to feel like a bad owner whenever I mentioned it. Something had to give so I went to see Steve from K9Pro, I learned how to have fun with my dog and also there was a time to play and times where I would not play. This was gold, Gyro is my pet dog, I never wanted to take him herding and it wasn’t a fix, it was a distraction or management at best. I now know that all that was happening was that he was getting fitter each week and I was heading in the wrong direction. He is super chilled at home now and we play awesome games at the beach. Steve is an exceptional trainer that has methods and techniques to get training moving forward. I would class myself as a dogsports enthusiast and the only people I have seen that are at Steve’s level are the top trainers from the USA and Europe. I train my German Shepherd in personal protection, or at least I thought I did. My dog was essentially being trained as a sport dog but just no formality. he was equipment focused and when doing his bite work, he was out of control. This was not obvious until Steve asked me to handle him without a beck tie, he just pulled me where ever he wanted to go and ignored my commands. This was hard to swallow, I had been training with another guy for 2 years and when Steve threw the sleeve off to one side, grabbed me and all my dog wanted to do was go after the sleeve, it sank home hard. I now have a dog that is not at all equipment focused, this didn’t happen overnight but I suspect my old training saw to that. 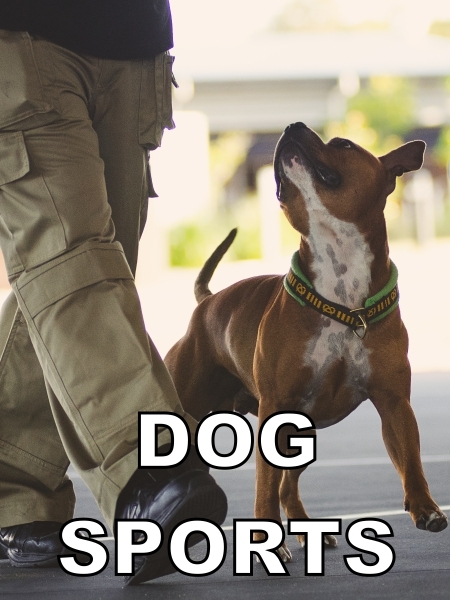 I learned how to cue behaviours, identify threats and control my dog. My dogs behaviour had got to a point where I was thinking, the unthinkable. No one could help me, trainers just suggested I put him down or just keep trying the same things. Steve seemed to like my dog and his “drive” and it turned out that my dogs un directed drive was causing the problem. Steve doesn’t train or even think like other trainers, I went to see him 8 months ago with a dog I was ready to put down, today he won the obedience ring and is a pleasure to own, train and most importantly, be around. Steve has an unbelievable way with dogs, they just love him! Our lessons saw Steve cut through the confusion and set me up a training system in minutes that got us moving forward again. Wow what a refreshing change from the paddock bashing I was doing practicing the same old (ineffective) routines. Dooley was at the end of the line, literally. He had bitten five people and we had decided to put him to sleep. I called the vet in tears and the vet nurse said she knew someone who has helped a lot of their clients and dogs. I told her that I had been to see a behaviourlist already, she said “trust me, go see Steve”. We were at Steve’s place only five minutes when he noticed Dooley had a neck injury and was in pain. With some gentle message Dooley took to Steve like they were old mates, Steve referred us to a dog Chiro who has treated Dooley twice now, NO MORE BITES! Golden Retriever who wouldn't come when called! Hi Steve, we just got home from our “High Intensity” training with you, I have to say with all my heart that I thoroughly enjoyed the 2 days we spent with you, you are a true master of what you do. We have so much confidence now, we look forward to updating you on our progress! I had dogs all my life, I thought I knew how to train them quite well, until, I saw Steve work with my dog. He had my dog performing better in minutes, the speed of response, focus on me was something i was unable to get previously. behavioral issues with my dog and had sourced out many trainers, some good and some better and although some little things were sorted, a couple of things just got worse over time. My dog was becoming very reactive to other dogs and people but was the loving cuddly peaceful dog at times too. It was beginning to take over my world with worry, sometimes to the point of distress when it came to others that he would come in contact with, as well as the impact that the lack of knowledge to assist my dog was having on his stress levels (which of course didn’t make the problem go away, only escalate). I have to say not only made me lose confidence with these so called experts, but also began the breakdown of my bond and relationship that I loved so much with my dog when he was at his best. It is very clear that when your struggles begin to outweigh your enjoyment, that something is not heading in a good direction, and that something must come to an end. I am not one to give up easily and with the struggles to find the right methods and trainers, I knew there had to be something more to it. Something was missing, and the professionals I had sourced where obviously doing the best they could with the information they had. They must have been missing a crucial component or simply didn’t believe there was more to what they had learned or discovered. shelter or even worse..have them put down because they cannot be “fixed”. I saw the commitment of a pet in the same way as the commitment I made to having children (and we all know how so much conflicting information about raising kids there is out there when it comes to what is right & and wrong, healthy or not, acceptable and unacceptable). I knew I just needed to keep looking but also had to changed the angle of what I was looking for. I knew my dog was clever, easy to train and lovable (he had shown me that in the beginning)…I knew I was committed and did the work, so why wasn’t anything working? I put it down to psychology…most training came across quite generalized, so maybe my dog had something psychologically that was different, slower, faster or damaged. Just as with kids, one template doesn’t always fit all…and sometimes things need to be investigated further with a specialist to see exactly which category they fit into. psychology of dogs were taken seriously by someone, but more so because of the extended questionnaire which really affirmed that Steve was probing for insight and knew exactly what he required to prepare for our sessions to be successful. wonderful assistant Bec and then introduced to Steve, who from the moment he opened his mouth began to trigger waves of emotions in me…from sadness, to frustration to elation. I was sad that I had not found him sooner and allowed things to get so difficult. I was frustrated that his knowledge and insight isn’t something other trainers possess (how could these things not be regulated). I was elated to know that everything could start from scratch right there and then, and that nothing is at a loss. The time we spent with him not only put me at ease, it brought me so much hope that I could finally have the dog I know deep down he is…we just needed to right guidance and information. It was such a personalized session and while I though he was just loading us up with information and not really paying much attention to our dog, our session concluded with a summary of our dog…. “there were some developmental interference at the age or 4 or 5 months of age” he went on to say. And all this information was being observed and assessed without us even noticing…just like a magician. He couldn’t have been more spot on…our fur baby was rescued from a shelter at about 5/6 months of age and he was a terrified little things that came from some abuse. We were blown away at how much this man knew, not just on the training aspects but more so about the psychology of dogs. We hit the jackpot and I was teary from the relief. program was in the making to be sent. Which brings me to the other impressive part of Steve’s work…his programs are accessible through a portal which are so personalized (not only to the dog but to your own lifestyle and needs) and broken down so simply that even a child could execute them. I thought the money invested at our first session was more than worth it, but its the follow up plan and continuous contact that is the confidence builder and the reassurance that his method is infallible. Now that is PRICELESS. I began to love reporting back to Steve and hearing not only that we were on track but also the quick adjustments when things weren’t going to plan. It was the wonderful source of reassurance, encouragement and praise from Steve along the way that truly goes above and beyond most services these days. bit extra Steve always gives. built, so I booked in for one of his packages. I was recommended some local accommodation which catered for pets. Madison’s mountain retreat was not only dog friendly, it was a gorgeous retreat which allowed me to revitalize and nourish my soul with some time out in between sessions, and the bonus was that it was only around 5km from Steve’s premises. I would revisit Madison’s just for future family escapes (which can now include our dog). I spent my package over two days with Steve and not only learned so much more, I received confirmation upon arrival of the progress my dog has made since our first session. Now here comes my little take on Steve…he’s a man of conviction, a man of knowledge and a man with a wonderful sense of humour and compassion. The more time I spent around him, the more I was in awe. He has a way like no other trainer I had come across, not only in terms of his knowledge and passion of dogs, but of human nature in general…his guidance reaches far beyond dog training, he’s in many ways a life coach too. walks which consist of what they were meant to be…fun and carefree. I can have people over now trusting that both dog and I are confident that we can continue to have a social home without fear of danger. becoming the dog he was born to be and the one I fell in love with. method then we there would be less dogs in shelters and far more love added to every home…after all, a dog is a man’s best friend and the true meaning of unconditional love. I am so happy I didn’t give up. 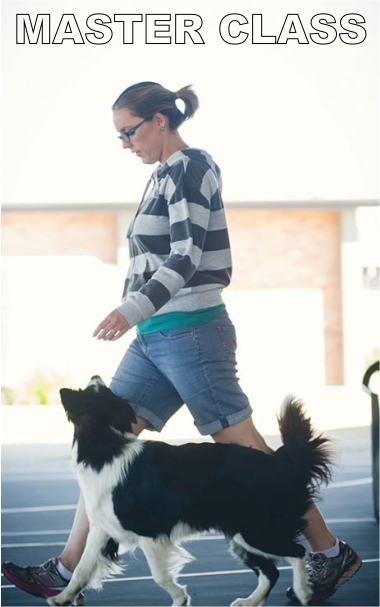 Don’t hesitate, come and discover Dog Training’s best kept secret! Steve has helped thousands of people and their dogs. When it comes to behaviour problems, Steve is where people come when everyone else says no. No matter how big or small your problem, or dog, Steve will design a solution that you can manage and your dog will benefit from. Steve is well known for producing outstanding results in the Competition Obedience World. His Training in Drive program is second to none. If you compete and feel your dog isn’t giving 110%, if your slaving away and getting nowhere, you owe it to yourself to book a lesson with Steve and let him show you what your dog is capable of. Programs are fun, energetic, non repetitious motivational concepts and games. OK so you know how to teach your dog to sit, but is the technique your using producing the end result you dream of? If you don’t know what these terms mean you need to get yourself along to a Master Class. Learn the tips, tricks and secrets that produce those ring winning results!